The US rapper’s duet with Rihanna tops the Official Streaming Chart today for a fourth consecutive week. The Monster made its Official Streaming Chart debut back in November, entering at Number 82. It climbed a massive 80 places the following week, before claiming the top spot four weeks ago. 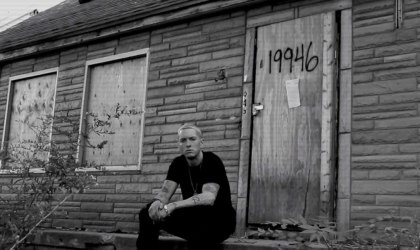 It is Eminem’s first Number 1 on the Official Streaming Chart (which launched in May of last year) and Rihanna’s second (Diamonds peaked at Number 1 last October). Bastille climb from Number 5 to Number 2 with Of The Night, while One Direction hold firm at Number 3 with Story Of My Life. Lorde’s Royals is down two places to Number 4, while Lily Allen’s cover of Keane’s Somewhere Only We Know falls one place to Number 5 on this week’s Official Streaming Chart. Christmas is still two weeks away, but that hasn’t stopped a whole selection of seasonal songs making their way into the Official Streaming Chart Top 100. Led by Wham!’s Last Christmas (which re-enters today at Number 19), there are 16 other Christmas classics on this week’s Official Streaming Chart; the lion’s share (10) of those belong to The King of Christmas himself, Michael Buble. It’s Beginning To Look A Lot Like Christmas is at 29, followed by Santa Claus Is Coming To Town (46), Jingle Bells with The Puppini Sisters (54), White Christmas with Shania Twain (56), All I Want For Christmas Is You (58), Holly Jolly Christmas (71), Santa Baby (72), Christmas (Baby Please Come Home) (73), Have Yourself A Merry Little Christmas (75) and Silent Night (97). Mariah Carey’s All I Want For Christmas Is You re-enters at 23, while The Pogues’ and Kirsty MacColl’s Fairytale Of New York is at 34 and Shakin’ Stevens’ Merry Christmas Everyone is at 37. Band Aid’s iconic 1984 Christmas Number 1, Do They Know It’s Christmas, is back in at 69, while Wizzard’s I Wish It Could Be Christmas Everyday is at 89. Frank Sinatra’s Let It Snow Let It Snow Let It Snow completes this week’s festive re-entries.